I love a rich, flavorful curry served over rice, but to lighten it up I'll often use a cauliflower pilaf instead of white rice. 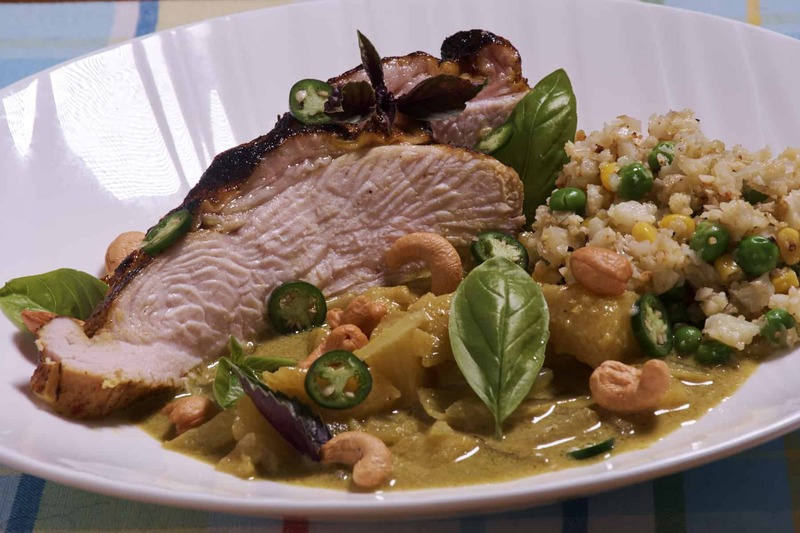 The pilaf helps soak up the curry while cooking the turkey first with sous vide ensures that it comes out perfect every time. 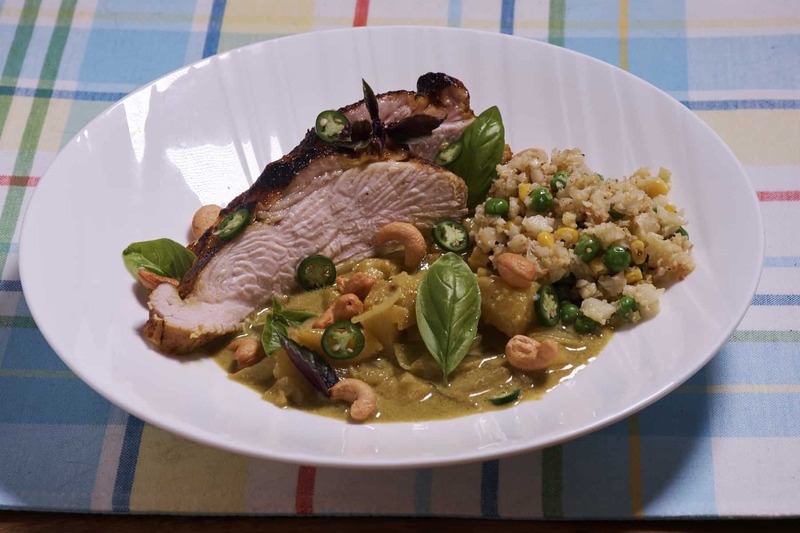 I like to use a Panang curry paste, but a typical green curry paste will work as well. The version isn't very veggie-heavy but I'll often add green beans, snow peas, asparagus, or broccoli to it. I prefer my turkey cooked at 141°F (60.5°C) until pasteurized. It usually takes 2 to 4 hours but you can use my Sous Vide Timing Ruler for an exact time, or my poultry pasteurization chart. 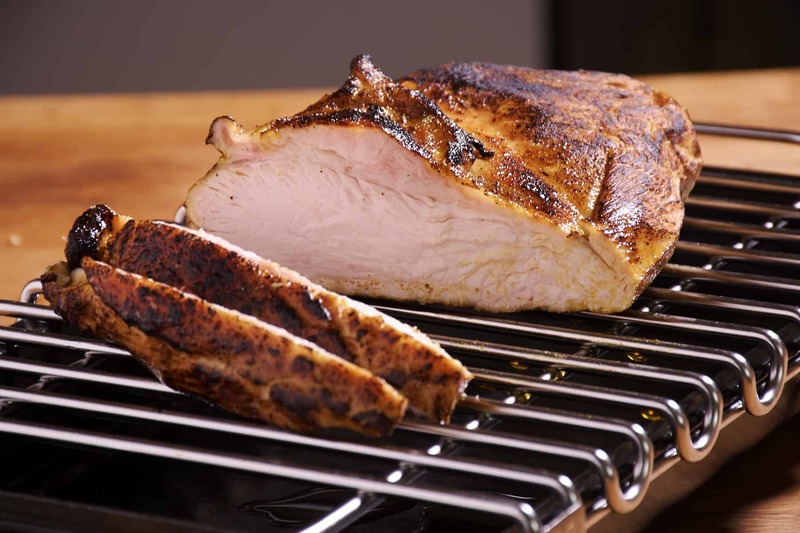 I seared the sous vide turkey using a Bernzomatic TS8000 torch with the Sansaire Searing rack. Mix the spices together in a bowl. Salt and pepper the turkey then sprinkle with the spice mixture and seal in a sous vide bag. Place the sous vide bag in the water bath and cook for 2 to 4 hours, until pasteurized. About 20 minutes before the turkey is done begin working on the curry. Heat oil in a pan over medium heat. Add the onions, garlic, and curry paste then stir for 3 to 5 minutes, being careful not to burn it. Add the coconut milk and pineapple then bring to a simmer. Reduce the heat and cook for 15 minutes, until it is reduced and thick. Remove the turkey from the sous vide bag and set aside. Add some of the juices from the bag to the pan with the coconut mixture and simmer for 5 more minutes. Add the lime juice, fish sauce and brown sugar then stir well to combine. Remove from the heat. 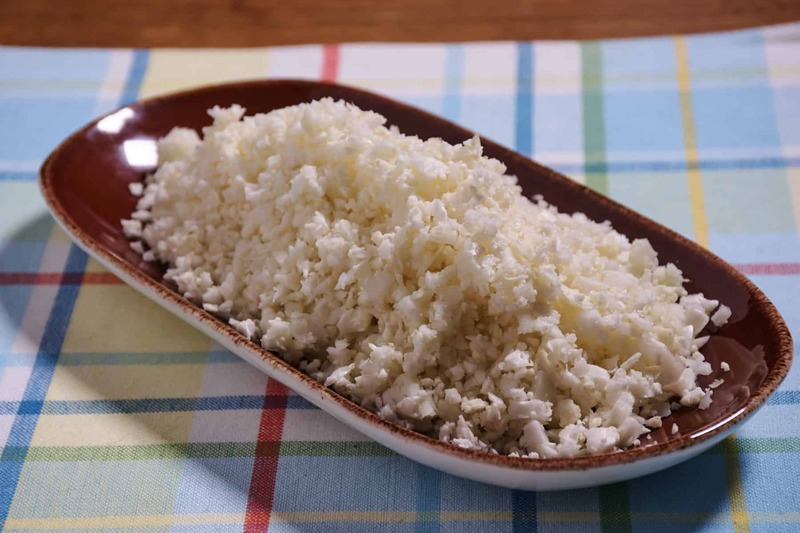 Place the florets in a food processor and pulse several times until they are the size of rice. Heat some olive oil in a pan over high heat until it is just about to smoke. Add the cauliflower and fry until it just starts to brown, about 3 to 5 minutes. Mix in the peas and corn then remove from the heat. Dry the turkey off thoroughly using paper towels or a dish cloth. Quickly sear the turkey for 1 to 2 minutes per side, until just browned, then remove from the heat and cut into slices or chunks. Place some of the cauliflower pilaf in a bowl and spoon the curry over the top. 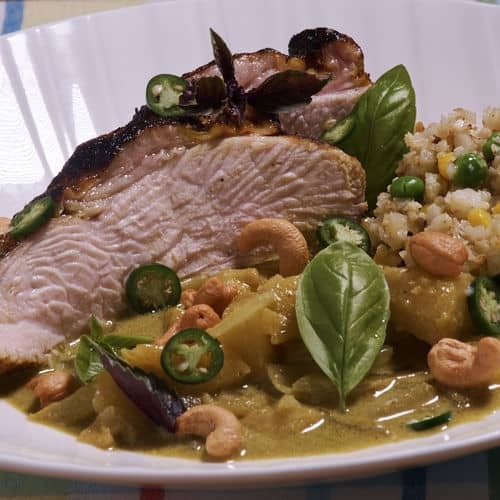 Add the turkey to the top, sprinkle with the roasted cashews, basil leaves, and serrano slices then serve. 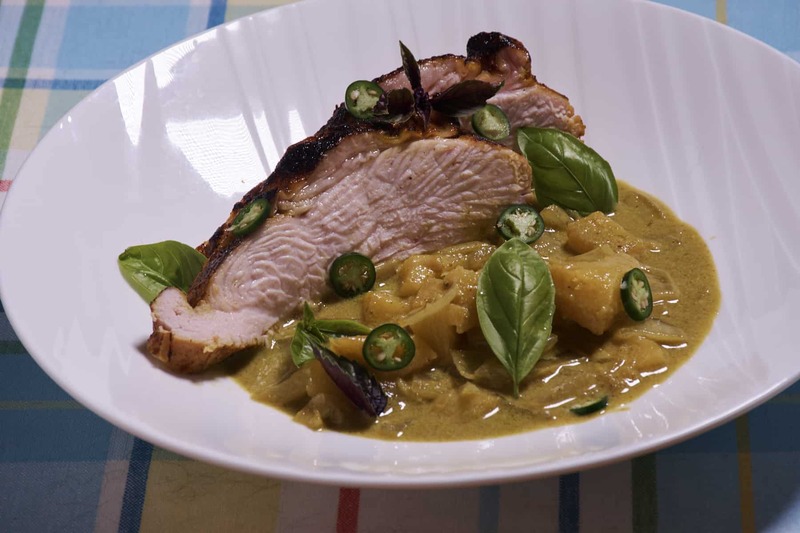 This sous vide turkey curry recipe is the perfect dish for a healthy but hearty dinner!